Photos by Liz Martiniak. ©Liz Martiniak 2003; all rights reserved. 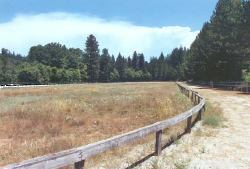 LOMA RICA RANCH in Grass Valley, California, is the final resting place of the multiple world-record record setter NOOR, the second great horse owned by automobile dealer Charles Howard (the first was Seabiscuit). A tall, leggy colt by Nasrullah, bred in Ireland, he won four races out of 13 starts at ages 2 and 3 in England, and ran third in My Love's Epsom Derby Stakes. The high-strung colt was purchased from the Aga Khan by Howard as a package deal with another horse, Irish Derby winner Nathoo, and shipped to the U.S. in 1949, winning one small race in six starts in that abbreviated season. The next year he emerged as one of the best foreign-bred horses to ever run in the U.S., setting three world records on successive Saturdays -- at nine, ten, and 14 furlongs -- and winning every important race in California for older horses, beating Triple Crown winner Citation four times. He was voted Champion older horse in 1950, but Howard had died earlier in the season and did not live to see this honor. His son, Lin Howard initially had Noor stand in Kentucky for one-half and one full season, after which Noor was brought back to California, where he stood at Howard Stock Ranch, Moorpark, southern California. At age nineteen he was sent to Palo Altan Fred Knoop's Loma Rica Ranch in Grass Valley (Deck Hand, Draft Card, Prince Little and Wallet Lifter were stallions there in the early '70s), where he lived another ten years, dying at age 29 on November 16, 1974. He was buried in the infield of the ranch's 1/2 mile training track. Remains from the infield were sent to Old Friends --P.E.